Ricky Nelson has been safely enshrined in the Rock And Roll Hall of Fame for 24 years. As a star of the long running Ozzie and Harriet television series, he became one of the first teen idols of rock music during the late 1950s and early 1960s. He placed 54 songs on the Billboard Pop Singles Chart during his career but only two reached the top of the mountain. Fifty years ago this week “Travelin’ Man” replaced “Mother-In-Law” by Ernie K-Doe as the number one song in the United States, ultimately spending two non-consecutive weeks at the top. Jerry Fuller wrote the song and originally offered it to Sam Cooke, who turned it down. Nelson then quickly recorded the song, which went on to sell six million copies worldwide. Overall Nelson would go on to record 23 songs written by Fuller. Typical of the innocent early 1960s, “Travelin’ Man” was a catchy pop song about having a girl in every port, including an Eskimo, a señorita, a fräulein, and a china doll, among others. The flip side was also a hit song. “Hello Mary Lou,” written by Gene Pitney, also entered the top ten. Interestingly, it was the A-side of the single in most other countries. It reached number two in England and spent 14 weeks at number one in, of all places, Norway. Nelson was only 21 when “Travelin” Man” became a hit, but it would, in many ways, mark the end of the first period of his career. He would start calling himself Rick Nelson instead of Ricky, and he would begin issuing more pop-oriented material as opposed to the rock songs that dominated his early releases. 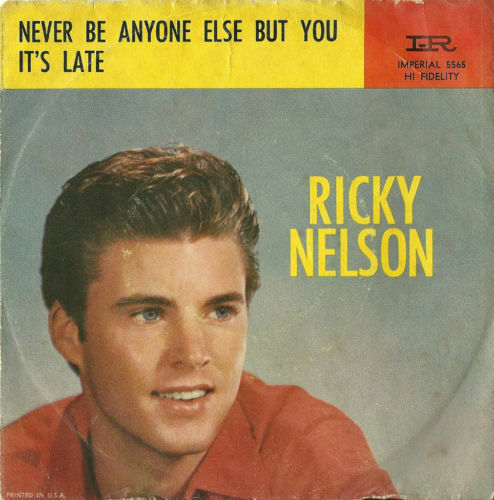 Ricky Nelson would produce dozens of memorable songs during his career, but very few as good as his second number one hit. It was a well-deserved number one song 50 years ago this week. 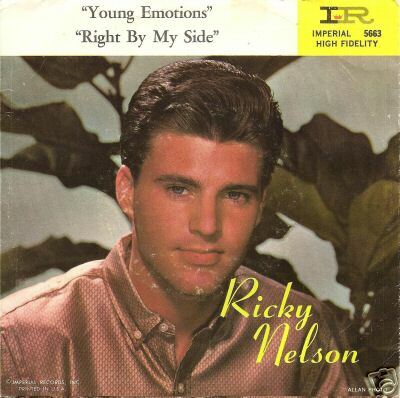 Ricky Nelson placed 54 songs on the BILLBOARD MAGAZINE Singles Charts but only two made it to number one. The first of the two became the first single to top the newly created BILLBOARD Hot 100 Chart. Billboard had just discontinued their Most Played By DJ’s Chart leaving only their Top 100 and Best Sellers In Stores Chart. The Top 100 became the Hot 100, which would be their major pop singles chart for decades. “Poor Little Fool” became the initial number one song on the Hot 100, August 4, 1958, and it remained in that position for two weeks. It also topped the Best Sellers In Stores Chart for the same two weeks. Ricky Nelson had a big advantage over most other recording artists of the 1950s as he was able to sing his songs at the end of the popular OZZIE AND HARRIET television, which had made him a star and one of the original teen idols. He came into millions of homes via television each week, which enabled him to sell tens of millions of albums and singles during the late 1950s and early 1960s. Ricky Nelson was second only to Elvis when it came to rock ‘n’ roll idols of the 1950s. His exposure on his parents television show, OZZIE & HARRIET, gave him a huge fan base and his singing his new songs at the end of the shows introduced his music to millions. Many times he would issue a rock song on one side of his singles and a ballad on the other and then wait to see which would receive the most radio airplay and become the bigger hit. “Young Enotions/Right By My Side” was issued during the early spring of 1960. “Young Emotions” reached number 12 on the BILLBOARD MAGAZINE Pop Singles Chart and “Right By My Side” peaked at number 59. The A side was a smooth slower song that was typical of many of his releases at the time. He would chart 54 singles, 1954-1973, and sell tens of millions of albums. He was inducted into The Rock And Roll Hall Of Fame in 1987, two years after his death in a plane crash. During the late 1950s and early ’60s, first and foremost there was Elvis Presley. Then there was Ricky Nelson. He was the embodiment of the teen idols that ruled the American music scene during the pre-Beatles era. His career traveled through several stages. In his early career with the Imperial label, he was a rock ‘n’ roll singer trading up-tempo rockabilly songs with smooth ballads. During his stay with the Decca/MCA label, he changed from a pure pop singer to producing some the earliest fusions of country and rock. Later bands like Poco and The Eagles would refine this genre, taking it in different directions. During his time with these labels he sold close 100 million records and produced dozens of hits. It was his time with the Epic label that is the great lost period of his musical life. Real Gone Records has now gathered all his recordings from his short, late-1970s stay with the label, issuing them on a two-CD set titled The Complete Epic Recordings. He recorded three albums worth of material for the label, but only 1977’s Intakes was released during his lifetime. The next album, the Al Kooper-produced Back To Vienna was never released. The third album, Rockabilly Renaissance, a return to his rockabilly roots, was issued after his death in heavily overdubbed form under the title Memphis Sessions. The Real Gone compilation marks the first time the three albums have been released in CD form in the U.S. It also marks the debut of 11 of the 41 tracks. My only complaint is that the sound quality varies, which may be due to the quality of the original masters. Other than that issue the material is a fine addition to the Rick Nelson catalogue and legacy. The rockabilly material has been issued in the original and overdubbed formats. While there is repetition, it was a good idea to include the originals. Songs such as “That’s All Right Mama,” “Almost Saturday Night,” “Dream Lover,” “True Love Ways,” “Rave On,” and others are a welcome throwback to his early rock ‘n’ roll days. Add in such undiscovered gems as “Call Of The Jungle,” “New Delhi Freight Train,” “Mama You Been On My Mind,” and “Conversation” and you have an album that will please any fan. The Complete Epic Recordings shows that Rick Nelson was producing high quality creative music toward the end of his life. This new compilation fills in a lot of holes in his discography and is well worth a listen. Article first published as Music Review: Rick Nelson – The Complete Epic Recordings on Blogcritics. 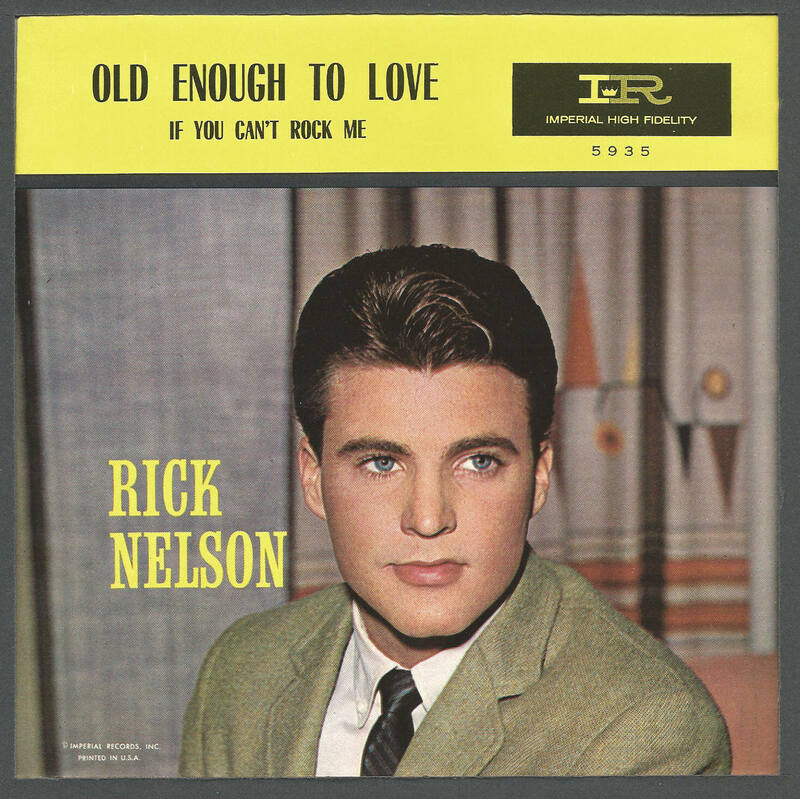 “Old Enough To Love/If You Can’t Rock Me” by Rick Nelson was a single released during early spring, 1963. Both sides made the BILLBOARD MAGAZINE Pop Singles Chart but made be the lowest, (or at least one of the lowest), charting two sides in rock ‘n’ roll history. “Old Enough To Love” peaked at number 93 in its three weeks on the chart and “If You Can’t Rock Me” checked in at number 100 for one week. “If You Can’t Rock Me” deserved better as it was actually a nice rocker from Nelson. Musical tastes were changing and this single got lost in the shuffle. I guess you can’t really call it a two-sided hit. During the early part of his career, Ricky Nelson released a number of double-sided hit singles. Many of them had a ballad side and a rock side. “Never Be Anyone Else But You/It’s Late” was released during late February of 1959. The A side reached number six and the B side number nine on the BILLBOARD MAGAZINE Pop Singles Chart. “Never Be Anyone Else But You” was a gentle ballad that appeled to his large female fan base at the time. “It’s Late” was the rocker and looked back to his rockabilly roots; a style that would disappear as his career progressed. The single received an award for over one million copies sold. His early career was built around a combination of rockabilly songs mixed in with ballads. Many of his singles became double hits, where both sides of the record would chart; usually one side would be uptempo rock ‘n’ roll and the other side something slower. During the early ’60s he moved toward a more polished pop sound. Nelson’s material has been released many times over the ensuing years. Unless you want to explore his legacy through a box set or the reissue of his original albums, though, the best representation of his sound is the 2005 release, Greatest Hits. Its 25 tracks cover most of his hits from 1957 through 1963, except for one song. My only complaint is that they are not in chronological order, which is always appreciated with a compilation album like this. The best of the rockabilly sides include covers of Fats Domino’s “I’m Walkin,’” “My Bucket’s Got A Hole In It,” and “Be Bop Baby.” This side of his career is often ignored today but these tracks, among others, remain an important part in the development of rock ‘n’ roll as it exposed this type of material to a middle American audience. Ballads such as “Poor Little Fool,” “Lonesome Town,” “Never Be Anyone Else But You,” and “Young Emotions” represent some of the best of the era. “Travelin’ Man” and “Hello Mary Lou,” released in 1961, continued the trend of combining rockabilly and ballads on one single but here more of a pop sheen was added to the mix. Both sides became huge hits, with “Travelin’ Man” reaching number one on the Billboard Singles Chart and “Hello Mary Lou” checking in at number nine. They remain two of Nelson’s better and most recognizable performances. “Fools Rush In” is the only track from 1963 and marked his transition to a pop sound. It would also mark the beginning of a downturn in his popularity as The Beatles were about to change music, likening his style and sound more as a link to the past. I would have liked to have had 1962’s “Teenage Idol” and 1972’s “Garden Party” presented back to back as they represent the two sides of his artistry and make for nice bookends when considering his overall career. Ricky Nelson died in a plane crash at the age of 45. He is a member of both the Rock and Roll and Rockabilly Halls of Fame. When the best of his music is culled down to 25 tracks, it becomes an essential listening experience to anyone even mildly interested in the music of the late ’50s and early ’60s. Article first published as Music Review: Ricky Nelson – Greatest Hits on Blogcritics. You are currently browsing the archives for the Ricky Nelson Reviews category.